The Baptism of Christ, the John Harvard Memorial Window, 1905 (damaged in WWII; reconstructed 1948). Works by La Farge are scarce in Europe. There is, however, a large memorial window in Southwark Cathedral in London. This cathedral is one of the oldest in London, with its foundation dating back to the seventh century. John Harvard was baptized in this church in 1607. 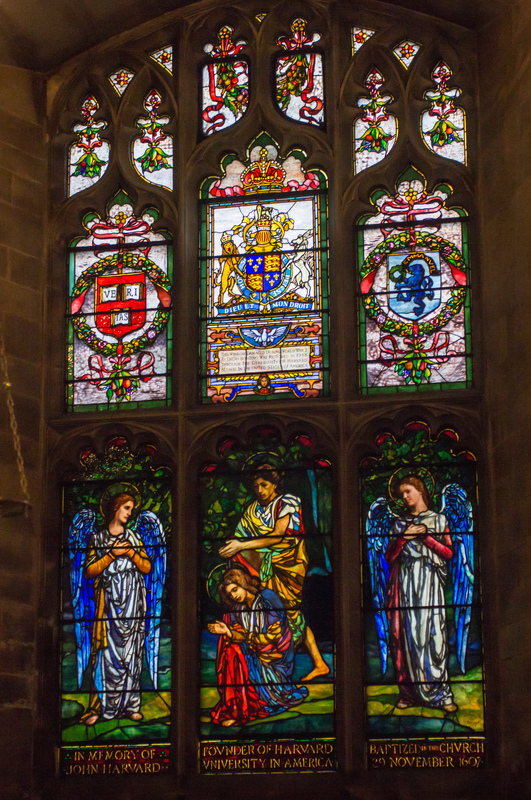 Nearly three hundred years later, Joseph Hodges Choate, a Harvard graduate and ambassador to the court of St. James, donated a memorial window to John Harvard in 1905. La Farge’s window was damaged in 1941 in a WWII bombing raid, and had to be reconstructed in 1948. The reconstruction of the faces particularly shows the damage. This window is composed of six lancet panels contained in a large traceried frame. The lower register of the lancets shows the Baptism of Christ by John the Baptist in the central panel, and attendant angels flanking them in separate panels. The baptism scene is modeled on a painting by the French Baroque artist Nicholas Poussin (The Baptism of Christ, ca. 1658, Philadelphia Museum of Art). The three panels in the upper register show the Harvard seal at the left, the Royal coat of arms in the center, and the coat of arms of Emmanuel College, Cambridge, where John Harvard studied at the right. A modern text panel below the Royal coat of arms notes the damage in 1948, and acknowledges the restoration sponsored by Harvard Alumni. Decorative swags fill the inset panels above the three upper lancets. http://cathedral.southwark.anglican.org/visit/usa-connections. Accessed June 10, 2015. The Times, quoted in “John La Farge, Our Only Old Master, “ (obituary), Current Literature, 50 (1, January 1911): 95.